Who would've guessed that a "Pizzagate" alum would spread unverified information to harm a political opponent? A Rebel Media personality played a role in the recent leaking of emails sent and received by newly elected French president Emmanuel Macron. Jack Posobiec — the chief (and sole apparent member) of The Rebel’s new Washington, DC, bureau — said that he came across an anonymous post on 4chan linking to nine gigabytes of emails, documents, and photos from inside Macron’s campaign. Posobiec told The New Yorker that he did not look at most of the material or check its validity before tweeting out the information with the hashtag #MacronLeaks, which soon trended in France. The information was posted an hour before the start of the official blackout period for French media and campaigns, which is meant to prevent the publication of content that could sway the election. The blackout ended when the last poll closed on Sunday. The Macron campaign warned that some of the released documents were fake. The blackout prevented France’s mainstream media from reporting on the leaks, but the information circulated through social media. The Toronto-based Rebel dedicated unusual resources to spreading news about the Macron documents to French speakers, tweeting links in French to a Rebel video by Eric Duhaime, a Quebec-based commentator for La Rebelle, the outlet’s new French-language channel. Posobiec openly supported Marine Le Pen, the far-right candidate who lost to Macron. He has also written for a website called “Citizens for Trump” and practices what he calls “4-D journalism,” in which he uses “activism tactics” to elicit a response or action, then covers that response. He previously helped spread the “Pizzagate” conspiracy theory. 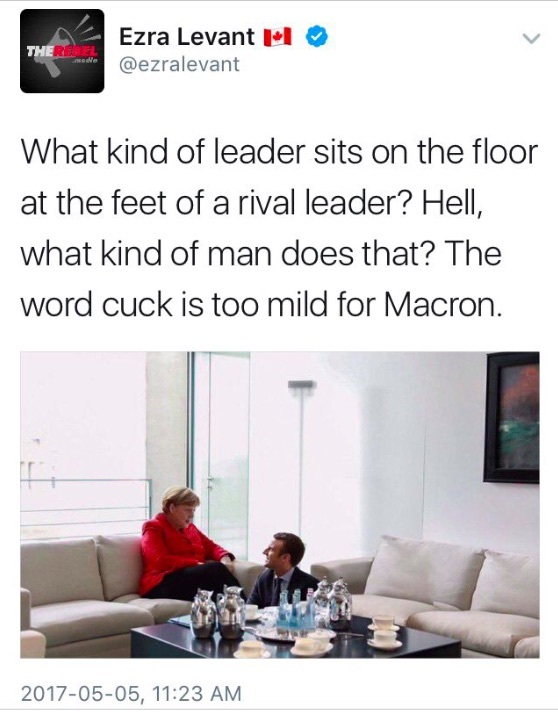 Posobiec also tweeted a doctored photo of Macron on the ground at the feet of German Chancellor Angela Merkel. 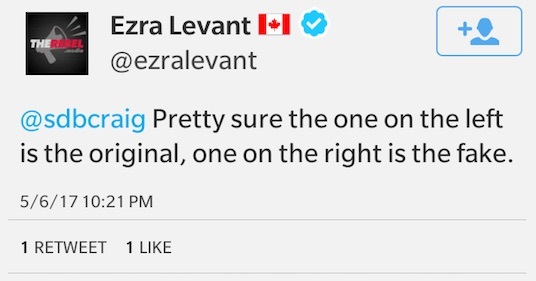 Ezra Levant, founder of The Rebel, also tweeted the photo but later deleted it after it was exposed as fake.